Fragrant heating pads are perfect for soothing mild aches and pains caused by arthritis or sore, overused muscles. Fragrant heating pads offer soothing comfort and aromatherapy benefits depending on the fragrances chosen, from ground cloves to lavender. For an effective therapy that won't break the budget, a heating pad can be made at home with a few ingredients and supplies. Whether you're making a fragrant heating pad for yourself or someone you know, the choices are nearly endless when it comes to materials and scents. Select a piece of cloth of your choice. You can use old clothes or mismatched socks lying around the house, or visit your local fabric store. Common fabric choices are flannel, fleece or cotton. 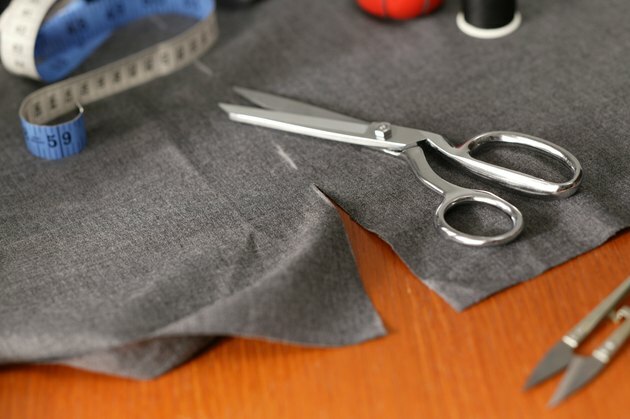 Cut two pieces of fabric into roughly 12-inch by 5-inch sections. Make sure to leave about 1/4 to 1/2 inch for a seam all around. Feel free to experiment with sizes and shapes according to your needs or whims. The most common shapes for fragrant heating pads are rectangles, but other shapes may work just as well. Turn the fabric right side out, placing right sides together. Match the edges and then pin or tack into place. Stitch up three sides of the fabric pieces, either using a sewing machine or by hand, and then sew about halfway up the length of the last side. For easier completion of the project, leave one of the short sides of a rectangular shape open rather than leaving half of a long side open. Turn the heating pad right side out, running an iron or fingers over the seam to press out corners. Make a filler for the heating pad. Rice is a common filler, but you may also use wheat, oatmeal, small beans like split peas or lentils, as well as seed corn. Add fragrance of your choice to the mixture. Common fragrances include lavender, rose oil, dried rose petals, rosemary, sage, cinnamon and crushed mint. Measurements for fragrance are a personal choice according to what smells good to you. When using a mixture of fragrance and filler, blend the mix and place it in a sealed plastic bag for two or three days. Shake the bag once in a while to blend the ingredients. Fill the pad with a filler of your choice, filling to about three-quarters full or according to your preference. Tuck the open edges of the pad toward the inside and seal by hand, using a running stitch or blind stitch as desired. Filler: rice, corn, beans, etc. To heat the fragrant pad, place it in a microwave oven for one to three minutes. If you desire moist heat, place a cup of water in the microwave while heating the pad. Watch the fragrant pad while it's in the microwave. Some herbs or fillers may have a potential to smoke and may even catch fire.